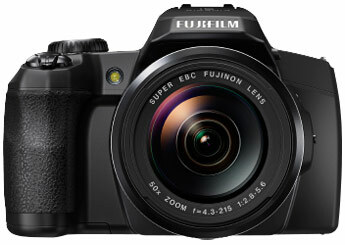 Fujifilm bridge cameras offer the best of both worlds. If you just want to point and shoot, they feature automatic modes to enable you to do just that, but they also provide more creative overrides for those times when you want to take control over your images. This makes them a good choice for photographers who want a camera they can grow with. Wide-reaching optical zoom lenses provide plenty of framing options and, because the lens can’t be changed, bridge camera users are unlikely to get dust on the camera’s sensor or in the lens. Despite their huge lens ranges, bridge cameras are neither bulky nor heavy, most are smaller or lighter than a typical digital SLR, so not only do they provide as much shooting versatility as an interchangeable lens model, they’re less of a burden to carry. The FinePix S1 is the world’s first bridge camera with weather-resistant capabilities. Not only does this mean you can keep taking pictures in wet weather, but also in dusty and sandy conditions, making it a great choice for all-round family use. The huge zoom range features five-axis image stabilisation for unprecedented levels of versatility, enabling you to capture super-sharp shots of everything from sweeping landscapes to distant details, while images can quickly be shared via a smartphone or tablet thanks to the built-in Wi-Fi connectivity. Picture quality is assured with a 16.4-megapixel BSI (back-side illuminated) CMOS sensor delivering great results in all conditions, including low light. A well-featured, highly versatile bridge camera with a 16.2-megapixel BSI (back-side illuminated) CMOS sensor that offers budding photographers plenty of creative options. The 50x optical zoom lens ensures that a huge range of subjects can be captured, while image stabilisation means they stay shake free, even at the telephoto settings. With point-and-shoot simplicity as well as manual overrides available, you can take as much control as you like over the images, while built-in filters provide extra creativity and Wi-Fi connectivity makes it easy to share shots via a smartphone or tablet. For those who fancy themselves as a film-maker, the S9400W also provides Full HD video capture. Boasting a powerful 40x optical zoom lens, the FinePix S8200 has a wide range of features including up to 10 frames-per-second shooting, a suite of built-in filters for creative effects, Full HD video capture and an electronic viewfinder for framing versatility. The 16.2-megapixel BSI (back-side illuminated) CMOS sensor delivers high-quality results in a wide range of conditions and is particularly impressive in lower light when other models may start to struggle. Powerful image stabilisation also helps keep your shots shake free. For those who like to share images and videos through social media, it’s simple to tag files to upload to Facebook or YouTube as soon as the camera is connected to a PC. Looking for a model with interchangeable lenses? 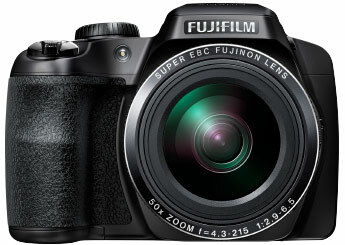 As well as producing high-quality bridge cameras, Fujifilm also produces compact system cameras with interchangeable lenses. They’re perfect for discerning users who want the very best results. When you’ve invested in a Fujifilm camera, it’s important to keep it protected to ensure it delivers years of service. Fujifilm provide bags, cases and straps that do just that and enhance X-series ownership.